I understand that when family is very often toxic to someone with very little positive influence and good times, I could understand not having regrets even in death. But when after so many good times, then one bad thing happens and the person is unforgiving, it's that unforgiving person that will be really broken when the funeral comes, unless they're really cold hearted. WHEN FAMILY AND FRIENDS GO THROUGH LIFE NOT SPEAKING TO ONE ANOTHER, THE DAY WILL COME WHEN THEY REGRET IT. 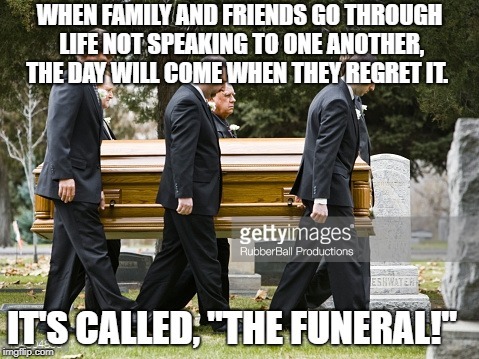 IT'S CALLED, "THE FUNERAL!"